In the case of the 2009 flu, as infections spread throughout North America and around the world, researchers in affected countries isolated many samples of the virus. The U.S. Centers for Disease Control (CDC) analyzed these samples and concluded that all the new swine flu infections around the world were caused by the same strain. The genes from all the samples are "99 to 100% identical" (Seppa 2009). 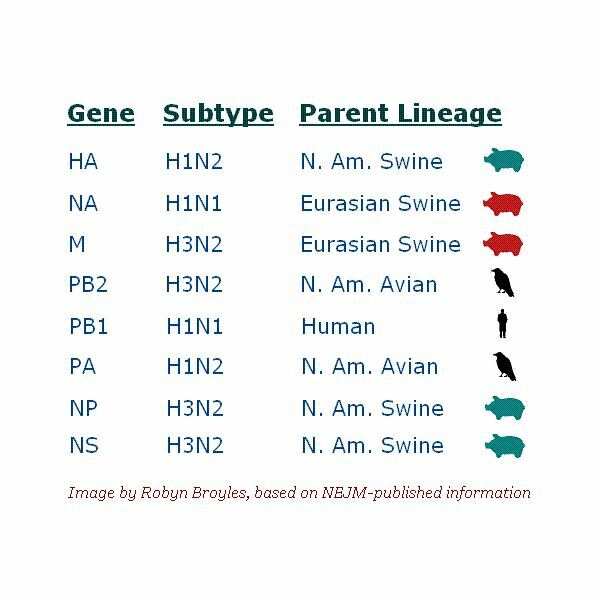 The popular media often describe influenza genes as coming from humans, birds, or pigs. However, they are not actual genes from these creatures — they are influenza virus genes from strains that evolved in those creatures. The Influenza A virus has eight genes, designated HA, NA, NP, NS, PB1, PB2, PA, and M.
Through a process called reassortment, different strains of a virus can swap genes when they infect the same individual. Reassortment means that each of the eight genes in a flu strain may have come from a different predecessor. The popular media initially reported that the 2009 swine flu virus was "a reassortment of swine, human and avian [influenza] genes." (CNN). On the other hand, a headline from the WIRED blog "Wired Science" trumpeted in late April that "Swine Flu Genes [Are] From Pigs Only, Not Humans or Birds." Swine Flu Facts: Where Did The Virus Really Come From? With various media sources contradicting each other, what is the truth about the 2009 swine flu’s genetic origin? According to an article in the New England Journal of Medicine, CNN and "Wired Science" are both right. At right: Origin of each of the eight A/California/04/2009 (H1N1) genes, according to a report in the NEJM. In 1997-1998, some swine flu strains began suddenly to evolve through "antigenic shift," a special type of reassortment in which genes from different subtypes combine (Olsen 2002). Antigenic shift frequently happens in Influenza A because this virus has so many variant genes available. This process is the reason genes from different species of influenza can combine in a single virus. The 1997-1998 antigenic shift caused avian flu and human flu genes to become included in some swine flu genomes. The eight identified genes of 2009 swine flu each came from a previously known strain of swine flu. Genes from the two major "branches" of swine flu, Eurasian and North American, were combined through reassortment in the new virus. But two of those eight genes originated in avian flu, and another originated in human seasonal A/H3N2 flu. Two originated in Eurasian swine flu and three in North American swine flu. So it is true that the virus contains genes from pig, human, and bird flu. "Emergence of a Novel Swine-Origin Influenza A (H1N1) Virus in Humans." Report from the Novel Swine-Origin Influenza A (H1N1) Virus Investigation Team. New England Journal of Medicine, published online May 7, 2009. Brandon Keim. "Swine Flu Genes From Pigs Only, Not Humans or Birds." "Wired Science," April 28, 2009. Published by WIRED.com. CNN.com, article by Elizabeth Landau. "Swine flu origins mysterious in ‘genetic arms race’." Last updated May 6, 2009, accessed May 14, 2009. Christopher W. Olsen. "The emergence of novel swine influenza viruses in North America." Virus Research 10 May 2002;85(2):199-210. Nathan Seppa. "Swine Flu Genetics Suggest a Vaccine Is Possible." Science News, May 1, 2009.